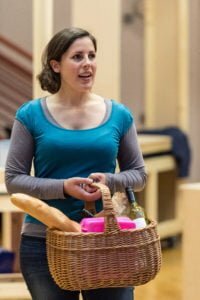 With the West Yorkshire Playhouse production of Into the Woods opening in Leeds TSOTA’s Natalie saunders interviewed actor Dean Robinson who plays character The Baker in the play and Louise Collett who stars as The Baker’s wife. 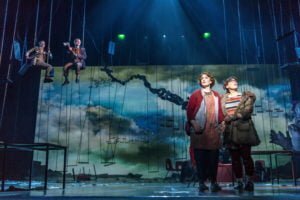 Firstly, Into the Woods is the first time you’ve worked on such a large production with the West Yorkshire Playhouse; were you at all worried that combining forces of opera and theatre wouldn’t suit the tone of the play? Dean Robinson: In so many ways Into the Woods is an ideal vehicle for an ensemble like ours. We’re used to preparing a huge variety of repertoire from Handel and Mozart through to Verdi, Britten and Janacek. Sondheim’s music is much more complex and intricate than it first appears and it requires a pretty thorough and diligent approach. Opera North has been lucky to have had Jim Holmes as conductor in several classic Music Theatre productions including Carousel and Sweeney Todd. Having this kind of musical leadership means that, for us, the crossover from opera to musical theatre is much easier. We’ve also had the invaluable input of Mary King who has helped us develop a way of singing the music more in the style in which it’s written, less “operatic”. She’s also helped us understand how singing with amplification requires a very different approach of using our voices than what we’re used to. We’re a pretty versatile bunch in the ON chorus and we relish the chance to explore new ways of extending our dramatic capabilities; having so much dialogue has been a great opportunity to do this, especially with a director of James Brinings calibre. Louise Collett: It is the first ever collaboration between the WYP and Opera North as far as I know and Stephen Sondheim’s Into the Woods is the perfect piece of music theatre to showcase the complementary strengths of each organisation. The musicals of Stephen Sondheim require rigorous attention to detail of both the music and text which will hopefully be evident in the performance! Into the Woods is now a well-known Disney film with Meryl Streep as the star, will the WYP’s version as an operatic play present a more exciting and vivid perspective compared to the film? DR: I have to admit to not having seen the film!! It wasn’t a conscious decision but I know it differs in many ways from a theatrical presentation. I can see how it would be an attractive choice for adapting to the screen as it moves quickly between scenes, but I think our production will sit beautifully in the WYP Quarry Theatre. 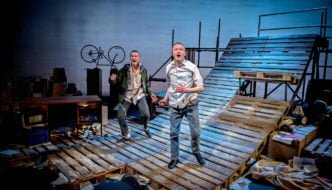 The wide-open, thrust stage gives plenty of scope for telling the story in a coherent and entertaining way. LC: The difference between the Disney film and the original 1986 Stephen Sondheim musical is that the stage musical caters to both adults and children in the audience, with the themes-particularly in the second half being darker than in the Disney film who (understandably) chose not to dwell on. As a member of the Chorus of Opera North you must be very proud of your vocal capabilities and your ability as a unit to create emotive responses from the audience. Did you encounter difficulties working on such a different project to usual or did everything seem to slide into place from the start? DR: Although we do sing a lot of standard operatic choral repertoire at ON, a huge amount of what we do has as much to do with theatre as it does with music. Knowing each other so well, particularly how we work together, is a huge advantage in presenting an ensemble piece like Into the Woods. The fact that it’s a different style of music theatre doesn’t really affect how we work together, but having so many roles means that we have more possibilities to develop those relationships. It’s been a fantastic opportunity. 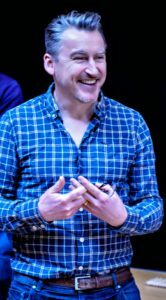 LC: I am extremely proud and privileged to be a member of the Chorus of Opera North. This project has been an honour to be a part of. The fact that we are so used to working with one another as a team has only enhanced the sense of ensemble within the show. The beauty here has been really discovering and developing our individual characters and their interactions with others. 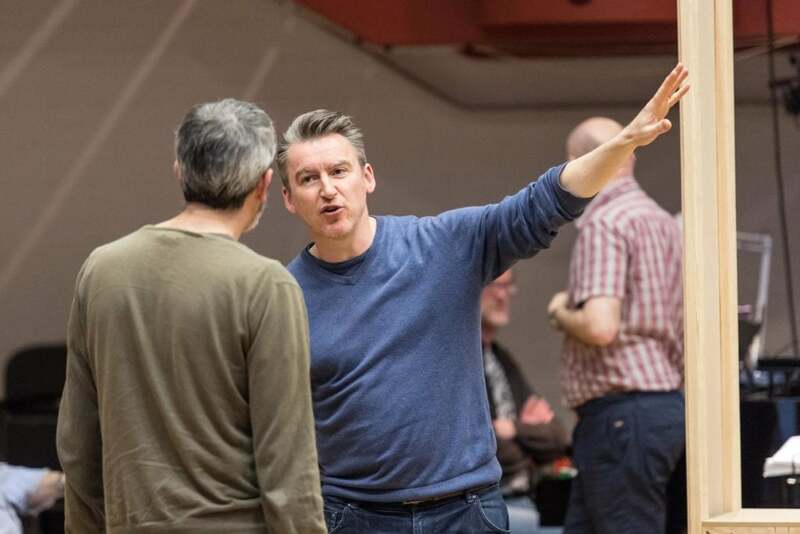 What’s it like working with the talented Artistic Director James Brining? DR: I’ve had the pleasure once before, but over 20 years ago! James directed a production I sang in of William Waltons “The Bear” in the Purcell Room at the Queen Elizabeth Hall. I remember him as an energetic and enthusiastic force, and the years haven’t dulled this! He’s been amazing during our rehearsals and preparations. 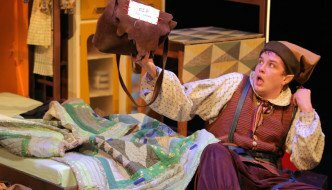 He’s worked in great detail and has created an original, funny and touching production. WYP’s strap-line is “the home of amazing storytelling” – that’s certainly the case in our show. LC: We have been very fortunate to have James leading us through the woods (!) He heads a very lovely company and it is wonderful that he has helped enable this collaboration. Colin Richmond has designed the set and the costumes; what can the audience expect from his designs? DR: I don’t want to give away too much, but there are elements of classic children’s fairytale illustrations with some contemporary twists. Colin’s costume designs are very striking, quite sumptuous in some ways. There is an ingenuity to how the set works which is at the very heart of the production. There is also some fantastically original, inventive use of puppetry, courtesy of Rachel Canning. Those who come and see the show are in for a wonderful visual treat! LC: Colin’s set and costume designs are simply wonderful. I have been amazed at the attention to detail everywhere but particularly the set. The ‘bakery’ even has running water! 14 June to 25 June, West Yorkshire Playhouse https://www.wyp.org.uk/events/into-the-woods/.